In 11th century Guido of Arezzo was educated and began his teaching and theoretical writing in the nearby Benedictine abbey of Pomposa. In Pomposa developed a traditional centre for plainsong instruction, which continued till 16th century. Native and foreign musicians did visit Ferrara, not only at court, but also in the cathedral and in the university. In the cathedral worked the composer Bartholomeo da Bologna (1405 - 1427). The gigantic council in Constance 1414 - 1418, occasionally attracting 100 000 visitors and more, had the side affect, that many musicians from various countries did meet there and exchanged about their techniques in a way, that never happened before. The massive gathering of prelates ended the Great Schism and brought literally thousands of musicians, both clerks and minstrels, together for an extended period of time, changing the course of music history. An individual result was the relation of the famous Dufay with the Malatesta family, which led to Dufay's important stay in Italy during the next 20 years (Carlo Malatesta was heavily engaged at the council in important position as procurator of the abdicting pope Gregory XII). The courts in Italy did exchange the impulses of the new time quickly. So in 15th century especially the court of Ferrara did win the status of an international important centre of music. 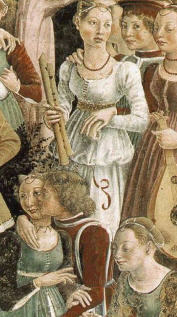 The duke's second wife, Parisina Malatesta, in our report to Ferrara an important person in Ferrara (1418 - 1425), is said to have played on a harp. Also Ugo, Niccolos son, had an instrument. In the 20ies several trumpeters were employed and 3 "pifferi" wind player. A Leonardo Chitarino (1424; the chitarino is a renaissance instrument intermediate between the lute and the "parlour guitar") is known in musical contexts. The great teacher Guarino came in 1429, he is exspected to have raised the interests in this direction. In 1433 a libro de canto was copied for the young Leonello, in 1337 a volume of regole de canto was made for his use. Leonello, although at that time not the ruler of the state, founded a court capella in the "royal manner", from four singers in 1436 it was increased to at least 10 singers in 1450. Nicolo Tedesco, a cantor suavissimus et pulsator eximius worked here from 1436 - 1462, perhaps he is identical with Nicolaus Krombsdorfer, who worked for the Habsburg Duke Sigismund in 1463. Other named singers at various times were Johannes Fede, Giovanni de Leodio, Andrea da l'Organo and Zoanna de Monte. Dufay wrote a ballade for Niccolo III., possibly he was in Ferrara in 1333, but surely in 1337. In music history it is proposed that Dufay and Leonel Power did meet 1438-39 in Ferrara, at the occasion of the council (can be doubted with good reason). The proven existence of English students at the university is accompanied by the existence of 2 large musical manuscripts of English composers in Ferrara. Under Borso (1450 - 1471) the musical interests changed from singers to instrumentalists, the greatest of them became the celebrated lutenist-singer Pietrobon del Chitarino. The theorist Ugolino of Orvieto (1457) and Benedetto Camelli da Pistoia (1458), but Borso more engaged in visual arts, Fresco-painting and book illumination. Ercole I revived the singing after 1471 and also other aspects of music. A great time developed, in the mist of it the young Isabella d'Este, called the most cultivated lady of their time, tought in her youth by a German singing master. Later, in 1497, when Isabella was just married to the Gonzaga-family, Mantegna, the famous painter, turned back from Rome. The first picture of Mantegna for Isabella was about Muses.